Potatoes, so mild-mannered and comforting, meet some spicy, vibrant friends in this very pleasing, intensely flavored dish. The potatoes are sliced thinly, and layered with sofrito, olives, capers and fennel, and they all combine to create wonderful tastes and textures. I just discovered this song, but I really like it! Tony Touch, the Beanuts and D’Mingo with Sofrito Mama. About 1 pound potatoes (4 medium sized) washed and sliced to about 1/4 inch. 1 medium bulb fennel – diced (about 1/2 inch dice). Butter a casserole dish that holds about 4 cups. Preheat the oven to 400. Drop the potatoes into a pot of boiling salted water, and boil them for about 5 minutes, until they’re soft but still have a bit of bite. Drain and rinse with cold water. 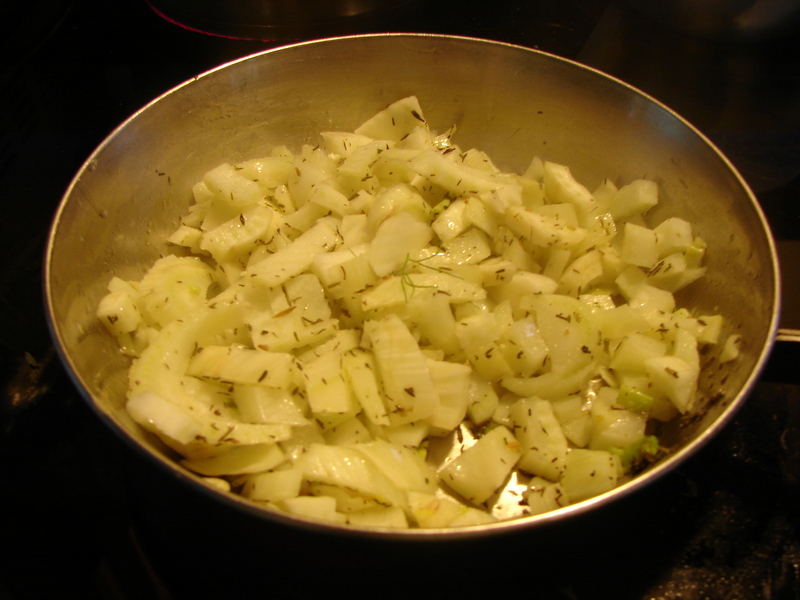 In a small saucepan, melt the butter and add the thyme and fennel seeds. When the butter starts to bubble, add the fennel, and cook till it starts to soften. Add the sherry to deglaze the pan, and cook further till the sherry is thickened and the fennel starts to brown slightly. In your casserole dish, put a layer of sofrito, a layer of olives and capers, a layer of fennel (about half of each thing). 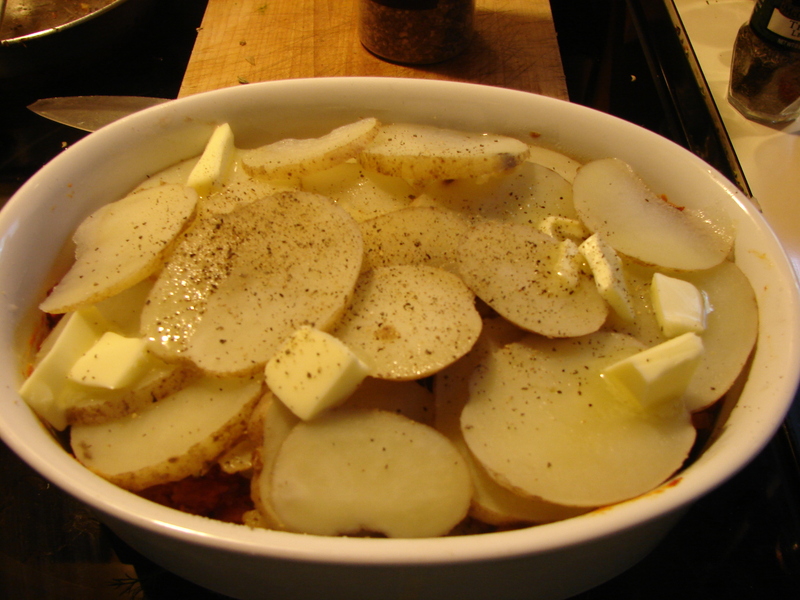 Then put a layer of potatoes, about 3/4 of them. 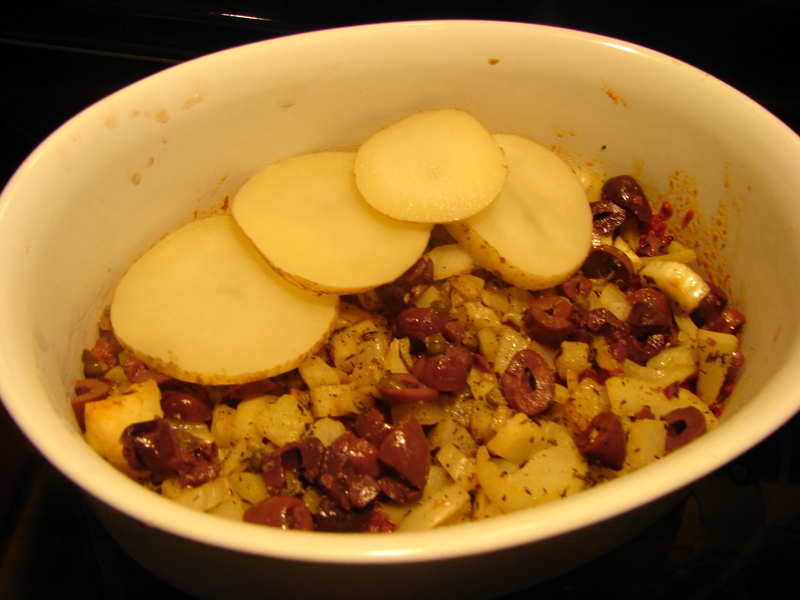 Then add another layer of sofrito, olives & capers, fennel, and finally potatoes. Dot the top with a little bit of butter. Cover lightly with foil. Bake 20 minutes, then remove the foil and bake 10 or 15 more minutes, until the potatoes on top start to brown. I like to put it under the broiler for a minute or two at the end, so it gets nice and crispy. 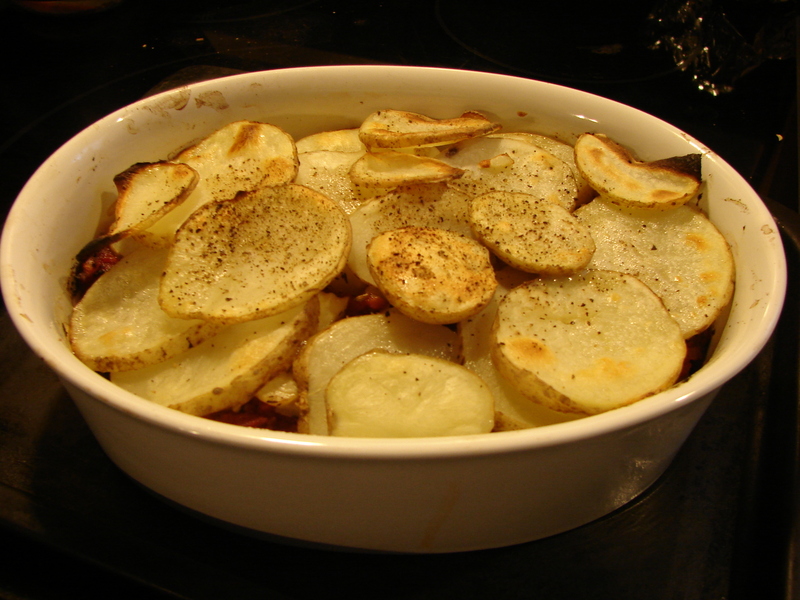 This entry was posted in potatoes, recipe, tomatoes and tagged fennel, gratin, potatoes, side dish, sofrito, tony touch by Claire. Bookmark the permalink. Sounds delicious. I’ll be trying this one. I was looking for recipes that had fennel as an ingredient. This was good, but because I smelled this pizza-like aroma from the sofrito sauce, I added shredded Parmesan the next time into the layers. FABULOUS. We serve it for ANY meal and it’s a hit! Thanks for sharing! I’m glad it worked out for you, and thanks for letting me know!